I have to admit something straight from the off here, 2008 saw me fall for the hype over and over again. Timeshift, Brutal Legend, and Kane & Lynch, all got me with thinly veiled promises and in your face marketing campaigns. One game in particular though grabbed me from the very beginning and hyped me right up to release. Too Human. Ten years on, Too Human remains an interesting tale of what can happen when development hell hits a company. 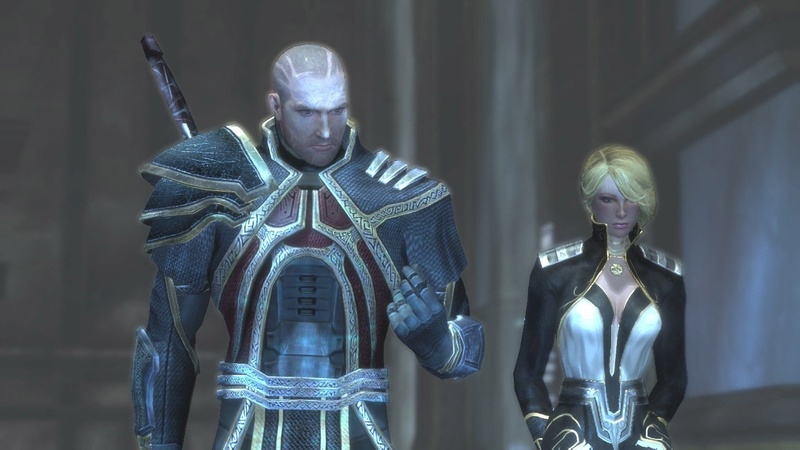 Developed by Silicon Knights, the guys behind the excellent Eternal Darkness and Metal Gear Solid: The Twin Snakes, Too Human was a third person, action RPG set in a cyberpunk retelling of Norse gods and mythology. You take on the role of Baldur as he fights to save a humanity that has been pushed to the brink of extinction, all while finding answers to his past. Too Human was intended as the first part of a trilogy exclusive to the Xbox 360 and now sits as not only a shining example of the very few blunders Microsoft made during that generation, but also as one of the biggest legal battles that the videogame industry has seen. Looking back after a decade there are some elements of Too Human that were ahead of its time; the RPG elements were deep for a game of this type and offer up many similarities to the likes of Destiny and other loot based progression games. The game also featured a decent albeit limited drop in, drop out co-op system that allowed for a friend to join you no matter how far into the game you were or how difficult the enemies. This allowed a new player to level up quickly and get into the fight with you. It’s a feature that many games have since expanded on and adopted. This all sounds like a good game, right? So where did it all go wrong? For that answer we need to step back a little further, in fact we need to look back almost another ten years to 1999. E3 ’99 to be precise. This was in-fact the year that Too Human was first announced, a trailer proudly promoting the game as an exclusive on the original PlayStation. Later that same year however, Nintendo signed up Silicon Knights under a contract that saw them create two exclusives for the GameCube. Development of Too Human immediately moved over to the new console, but ended up being shelved so the company could focus on Eternal Darkness. Eternal Darkness launched to critical and commercial success and Silicon Knights all of a sudden saw themselves crowned as the future of Nintendo’s console. They immediately got back to work on Too Human with a view of cashing in on the new found spotlight, Nintendo meanwhile needed a company they could trust to remake the original Metal Gear Solid. Konami certainly wouldn’t let any third party developer near the series, so, Nintendo it seems had no other choice but Silicon Knights. This would however complete the two game exclusivity deal the company had with Nintendo and they would be free to develop for all consoles after the release of Twin Snakes. Once again Silicon Knights hit high praise on the release of Twin Snakes and found themselves under the spotlight yet again. This however is where it all began to fall apart, as with the Nintendo deal over it seemed that Silicon Knights were at a loss on where to focus – by this point the console landscape had shifted dramatically. The GameCube wasn’t the success Nintendo had hoped and Sony were finally beginning to be challenged for the throne by Microsoft. So for the next four years the developer waited, the spotlight faded and they found themselves turning yet again to Too Human. Once again however it was a console manufacturer that came knocking at the door; this time Microsoft said they wanted the Too Human trilogy as an exclusive on their new console. The developer of course signed up straight away then, for the second time, Too Human was scrapped and rebuilt. Working on an unfinished version of the Unreal Engine the game quickly took shape, Silicon Knights however were not too happy with the state of the engine and asked Epic when it would be finished. Epic promised the engine would be ready in time for the Xbox 360’s development kit arrival and as now known Epic did indeed release a finished edition of the Unreal Engine alongside the development kits of the Xbox 360. Silicon Knights didn’t trust those words though and by this point had moved on to their own in-house engine. This is where it gets messy, Silicon Knights decided to sue Epic for not delivering the engine on time, despite Epic’s insistence that the engine arrived as and when promised. A legal battle ensued and rages on for a while. Too Human released during this period and it was clear that 10 years and two console changes hadn’t done the game any favours. The story was sub-par, the look was dated, and the pacing was all over the place. It felt like a game that had been cobbled together in a much shorter period and the critics panned it. Microsoft pulled the plug and Silicon Knights moved on to developing other games using their own engine. Epic Games however had other plans. During the legal battle between the two companies, Epic had discovered that the engine behind all Silicon Knights games from Too Human onwards was in fact full of thousands of lines of code from its very own Unreal Engine. Silicon Knights as it turns out had just pulled a copy and paste job on most of the engine. Epic counter sued immediately and Silicon Knights found themselves against the wall. Admitting they had originally sued Epic to cover up the engine they had stolen, Epic of course won the suit but it is the demands placed on Silicon games that are perhaps the most interesting. Silicon Knights were ordered to pay $9 million in damages to Epic and they were ordered to destroy all unsold copies of games using their own engine. Too Human and X-Men Destiny being the two big ones. Production halted and now the only copies of these games that will ever exist are those in the hands of the buyers. This has left these games in an odd position, both are pretty bad games but have since become popular items for collectors – Too Human in particular due to its close ties with this tale has become quite sought after. After all the work and legal battles, Too Human turned out to be a pretty big disappointment. The game had some serious pacing issues, with some levels taking upwards of two hours to complete. The game was also repetitive in nature and lacked any real combat depth. Loot drops were inconsistent and it requires a serious amount of grinding to complete a set of the highest level armour. It wasn’t all bad though and combat was fun and engaging, especially with the melee weapons, and playing with a friend offered up a lot of fun. It wouldn’t have taken an awful lot for Too Human to have actually been a decent game, fleshing out levels and breaking them up into smaller chunks would have helped. Adding support for 4 player co-op would have been a huge boost and if Silicon Knights had just waited for the final version of Unreal Engine, I feel all these things and much more could have been achieved. Instead Too Human stands as an example of why it is sometimes best to take a little longer with development or to make sure a game you have shelved for a long time stays on the shelf. It also is a shining example of bad decisions and subterfuge that has, in the past, been prevalent within the industry. Thankfully these kinds of stories are mostly behind us and we as gamers can now focus on the games rather than the politics that sometimes surround them.